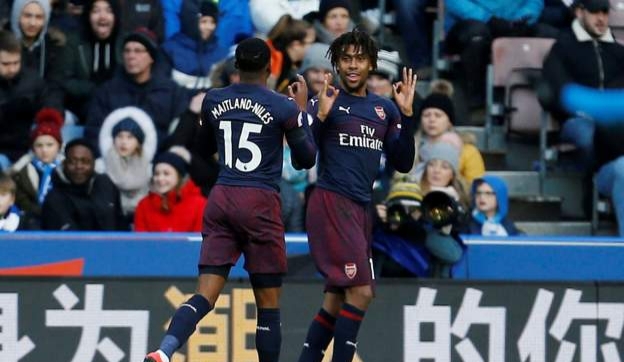 Super Eagles forward, Alex Iwobi scored to set Arsenal on their way to a vital win at Huddersfield Town in a Premier League clash on Saturday. Iwobi opened the scoring in the 16th minute, missed a couple of chances afterwards and was subbed off in the 87th minute. A goal by Alexander Lacazette in the 44th minute doubled Arsenal’s lead before a Kolasinac own goal in injury time halved the deficit for hosts Huddersfield. But the Gunners held on and secured all three points, but remain 6th on the table with same points as fifth-placed Chelsea, who have a better goal difference. At Anfield, Sadio Mane and Mohamed Salah scored to help Liverpool regain top spot with a 3-0 victory over Bournemouth. Georginio Wijnaldum was the scorer of the second goal for Liverpool. The Reds had lost the position to Manchester City, who defeated Everton in midweek, but secured all three points to go three points clear. Elsewhere, Super Eagles forward, Isaac Success was absent due to injury as Watford pipped Everton in a 1-0 win. Southampton fell to a 1-2 defeat to Cardiff City while Crystal Palace claim a point with 1-1 draw versus West Ham.